Imagine my surprise when my blog disappeared from the Internet for no apparent reason. But then came the shock of losing a year’s worth of writing. I must admit that those were very tense hours and days, but the real surprise came with what happened next. As I searched for the site and missing files, I began asking myself two simple questions: In the big picture, is what I do all that important? and Is it what I am supposed to be doing? It’s not a bad idea to ask these on a regular basis, especially since busyness often gets in the way. But as we examine our lives, motives and expectations, we must remember to pay attention to God, not Satan. For example, if God places us on a path we didn’t expect—a path we didn’t want, Satan tells us it isn’t fair. He tells us we don’t have to lie down for God and let Him make us do difficult and painful things, especially when it’s (here it is again) unfair. But there is a secret in the middle of all Satan says that makes it hard to ignore him (even though we must). He mixes in truth, then tosses in the lie that seems, on the surface, to make sense. It’s true that what we are going through may be painful and difficult. It may even seem unfair, and the path from which we were derailed certainly seemed better to our finite minds than the new reality we face. But it doesn’t end there. God doesn’t expect us to lie down for Him—He expects us to stand up and be deeply involved in the new path upon which He places us. Satan doesn’t tell us that it is the most exciting thing we can ever imagine—to be doing what God calls us to do. It is waiting for us, but we have to take that step. We have to trust God when He says that what’s on the other end of the tunnel is worth the step of faith. During my college years, I had the opportunity to do some cave exploring with some classmates for an environmental physiology class. We were collecting specimens of blind, albino species living in the cave system. 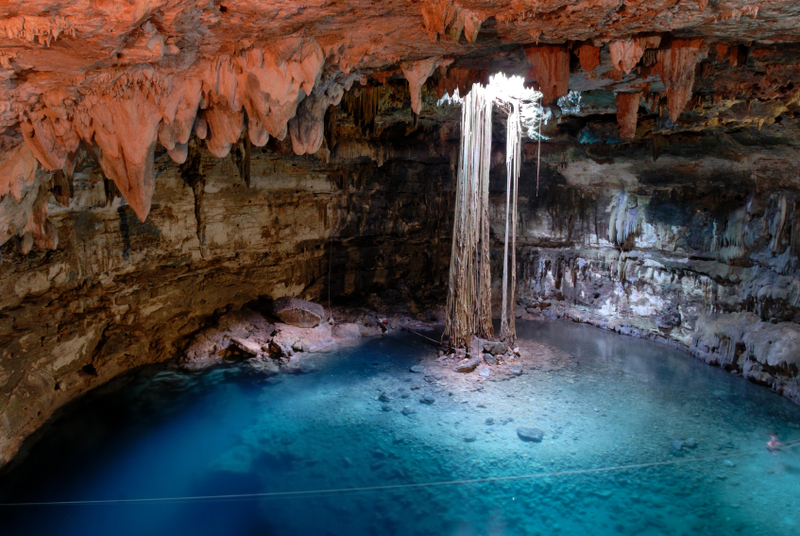 Experts had told us that one of the caves central chambers was enormous and filled with wildlife. But we were unable to gain access to it without repelling across a ravine, taking off our spelunking gear, belts, shoes and helmets, and wiggling on our bellies through a small tubular opening in the rocks. There were no other takers, but I wanted to see what was on the other side of that 20-foot crawl. I stripped off my climbing gear, and armed with nothing more than my flashlight, I began my downward scooch (not a real word) through the tiny tunnel. Part of the way through, the tunnel made a slight bend and I got stuck. I wiggled and wriggled, but I couldn’t budge. I thought about panicking when a large, white spider with bright red eyes climbed into the tunnel and arrogantly approached me. I hate spiders. We had permits to collect certain albino water-borne species, but were forbidden to capture or kill spiders. I kept telling myself that it would be worth it all to see what was on the other side, and realized that there was no way to back out anyway—forward was my only choice. After several minutes of wiggling and twisting, and allowing the spider to climb over me (he just wanted to get by) I finally broke loose and pulled myself into the chamber and stood to my feet. I was not prepared for what I saw. The domed ceiling soared a hundred feet over a glassy, still lake. Orange columns around the 10,000 square foot room towered twenty feet above me, as the white stalactites stretched their enormous arms down from the ceiling. The calm was intense, the quiet eerie, the scene magnificent. My flashlight revealed several albino crawfish in the water, and I collected one to take back to study (As I said, we had permits, and had come for that purpose. No harm came to the crawfish). If I had not trusted what the experts told us and made the effort to fight my way through that narrow passageway, I would not have seen a majestic wonder of God, far below the surface, that only those who push themselves will ever see. I have applied this experience to my life ever since. It has caused me to push through exhaustion, pain, and insurmountable odds. No matter what the situation, I demand more from myself than I ever would have. So—I will keep on blogging, writing, and sharing what I can—as long as God will allow me that privilege. Question: Have you been placed on a path you didn’t ask for?